Surrounded by nature and historical monuments – on-location photo shooting in Nara. Day by day, I find more and more signs that spring is on its way. Today, I’d like to introduce a new program that makes you long for spring. 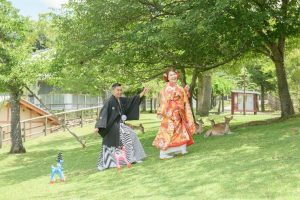 The new program is an on-location photo shooting experience, which will add a new way of enjoying Nara Park and its surrounding area. Change your clothes into outfits such as Japanese bridal garments or Western-style wedding dresses for women and formal kimono with Haori topcoat and Hakama pants or tuxedos for men. Then, let’s go to the best seasonal spots for photo shooting! A couple of women or men, or even a single person are all welcome! Traveling the spots by car and photo shooting with a professional camera operator and a make-up artist will be an exquisite experience. Various kinds of outfits are available for you. So, just bring yourselves to experience this full-fledged photo shooting. Below are a few of the locations for this photo shooting. Ukimi-do is a very popular spot for shooting. The photos always reflect good old Nara in every season. Nara is the only city you can take photos with deer! A shot like a moviescene. Panoramic view on Wakakusa-yama hilltop! We will bring you to the best spots for each season. Photo shooting in the season of cherry blossoms is quite popular! Please make a reservation early! In autumn, the scenery will be beautiful red leaves. Kimono best matches with autumnal leaves. 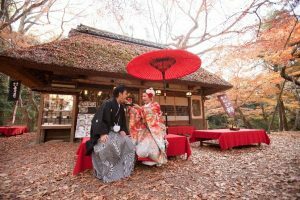 This on-location photo shooting is provided by Photo Studio Watanabe, which has a thorough knowledge of photo shooting spots in Nara and has been favored by Nara people for more than eighty years. The photos will be handed to you as digital data. The number of photos will be 100 to 150 (depending on the plan). In other places, you can hardly find such a wide variety of locations, from old historical spots to natural spots such as Wakakusa-yama hill and Nara Park. You can visit various spots without fatigue because a car for the on-location shooting is available for this experience! After the experience, please share your lovely photos with us! Winter has come to Nara. Morning mist in winter makes up the Nara Park beautiful, but winter also brings us the intense cold. What can we offer to make you visit and enjoy Nara in spite of this winter chill? Here comes a new program in which you can enjoy in a warm room! In this program, you make a kaleidoscope on your own in a lovely cafe “Kaleidoscope cafe Siloam”. 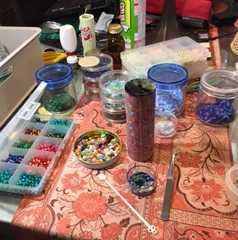 Colorful beads, pearls, and other variously shaped parts will make your kaleidoscope unique and original. You will be amazed at how fascinating it is. It is far beyond the toys we enjoyed in our childhood. Here’s my experience report of this program. “Kaleidoscope cafe Siloam” is located in a cozy town at the west end of Todai-ji temple. The first step is to assemble the inner parts of the kaleidoscope. Even if you are not so confident in your handicraft skill, you don’t need to worry. The master will steadily instruct and assist you. First, I assembled the mirrors which make the central part of the kaleidoscope. 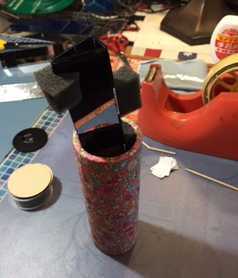 Then, I joined the mirror parts and the tube together, which will make the main body of the kaleidoscope. 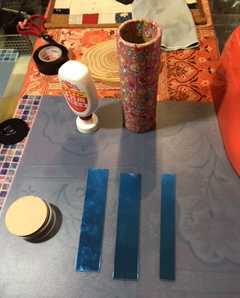 This process will affect how the kaleidoscope patterns look. Extra care is needed! After finishing the main body, I put the beads and other parts into the body, which make the patterns. However, it was not an easy task to choose from so many beautiful beads, pearls, and other parts! In case you feel difficulty in choosing, please ask the master and madame for the proper parts. They will kindly give you good advice! For those who don’t have enough time, a shorter plan is available, in which you can experience the kaleidoscope making from this phase! Let’s take a glance inside!! The motif is Nara in Winter! I can’t help praising myself for the beautiful patterns. They change their expression every time I turn my kaleidoscope. Because it’s self-made, you can enjoy yourself by guessing which beads or parts compose the patterns. I want to make another one with different colors! After you finished your kaleidoscope, please have a relaxing time with a cup of coffee and its rich aroma. This program includes the fee for one drink! 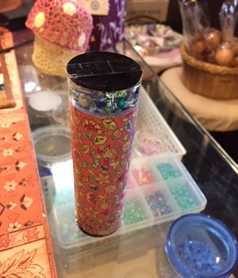 While enjoying your coffee,　you can also appreciate more than 200 artistic kaleidoscopes for sale. 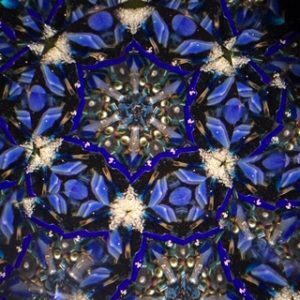 Looking into the ever-changing patterns of the kaleidoscopes is so fun that you might lose track of time. Talking with the frank madame and master is also fun. I recommend strolling Todai-ji temple after you leave the cafe. Daibutsu-den hall is about 10 minutes walk from the cafe, and Nigatsu-do hall is about 15 minutes walk. 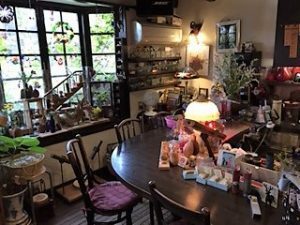 Furthermore, you can find Isuien park and the former residence of Irie Taikichi (a photographer who devoted his life to shoot photos of Nara) near the cafe. This cozy town is perfect for strolling around. Please come and enjoy this experience during winter! Sinyakushi-ji Temple was established for curing the illness of Emperor-Shoumu by Komyo empress. This temple is located the area of Takabatake in Nara Park. In Nara period Shinyakushi-ji had Golden (main) hall, East and West Towers. Moreover it was located next to the Todai-ji Temple according to the pictorial diagram called ‘Todaiji Sankai Shii-zu (painting of mountain border of four path to Todai-ji Temple)’ dated 756 . Seven Tathagatas of pharmacist were made with the bodhisattvas Suryaprabha and Candraprabha. The Seven Tathagatas were built the center, and the Bodhisattvas were the aside. After the construction, several natural disasters hit on them. Followed by thunderbolt in 780(damage to the West Tower), and the typhoon in 967(downfall to the Golden main hall.) Furthermore Heike(the Taira family) Great Fire made the temple destructed. Main temple building is still remains from Nara period. Many researchers suppose it was used to be the dining area. This building got the Japanese character of Tenpyo (ancient era of Japan.) National Treasured Twelve Guardian is the one of the best in Tenpyo period, and standing around the principal image to protect from enormities. That is the reason of why the guardian are showing their back to the principal image. All got different postures to guard the area. Yakushi-Nyorai (Tathagatas of pharmacist) seems to relieve the sufferings one by one with right way. She is really mother-like. Nara Wintter experience got “the priests are guiding early-morning exhibition to Main temple building of National Sin-Yakushiji Temple, and Koyakushi-do (incense medical area) where normally limited to enter. The secret Buddha of Otama-Jizo was found the Heisei-reparment inside of Kagekiyo-Jizo. Both are almost same size and that was unusual case. People pray two Jizo for easy-birth and health. A few days ago, I went to Totsukawa village♪ Totsukawa village is the biggest village in Japan in the southernmost part of Nara prefecture. Away from the city, I came to countryside, where healing world of the mountains. 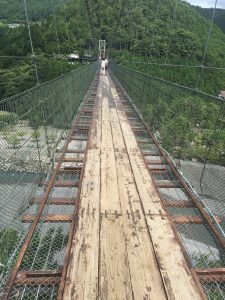 Most amazing place is “Tanize suspension bridge” which is a tourist attraction representing the Totsukawa. 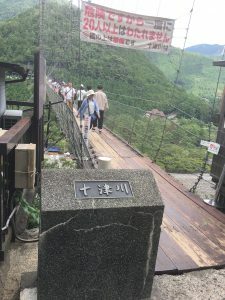 Enclosed in wire mesh and rising 54 meters over the Totsukawa River, the bridge built in 1954 to connect the villages of Uenochi and Tanize. Though quite safe, the swaying motion can be scared, or fun, depending on your mind. When I happened to pass people who came from the opposite side on the way, the bridge was really swaying! The bridge is quite long, terrific attractions. It was very scared and my legs froze. After I reached to the opposite side, found a good feeling teahouse! 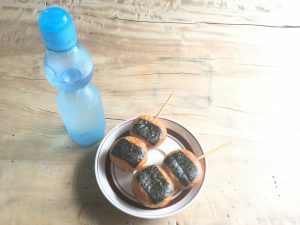 I ordered “rice cakes” and a bottle of “ramune soda drink”. I spent a while watching the scenery for a while. Daydreaming at the cafe is my pastime. Traditional Japanese-style rooms have floors of tatami mats. The mats are made of straw and rush and consist of a thick base and a soft, smooth surface that covers the base. The tatami mats are approximately 180 by 90 centimeters (6 feet by 3 feet). As tatami mats have a standardized size, they can be used to measure room sizes. Then, one mat is referred to as 1 jo and the size of a six-mat room, for example, is expressed as 6 jo. In addition to six-mat rooms, four and a half-mat rooms and eight-mat rooms are the most common in Japanese houses. The longer sides of the tatami are bordered with cloth. In the old days, the colors and patterns of the cloth depended on the status of the family, but people can chose their favorite colors and patterns freely today. When we walk in a tatami-matted room, it is bad manners to step on the borders. This is because the borders damage and wear easily if they are stepped on. Tatami mats Feel smooth and never get damp. 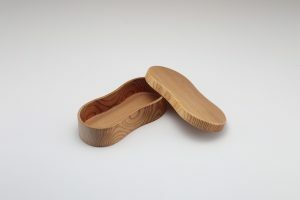 They are the ideal material for floors in Japanese houses as the humidity is high all year round due to the climate. We can always keep tatami mats in good condition by simply having their surfaces periodically replaced by expert tatami makers. We can enjoy the refreshing scent of woven rush when the surfaces are replaced. The program of [Experience tatami mats with a craftsman] (No298) give you a chance that you watch closely the artisanship of tatatmi and you make your own mini tatami mat. Finally! A cycling tour is now available! We launched an exciting cycling tour! 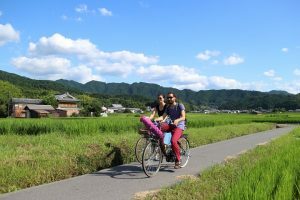 Enjoy slow cycling with a local guide in Asuka village, a rural area of Nara rich in nature and history. It is highly amusing for most people to visit historical spots, temples, and shrines in Asuka village. But for those who are not satisfied with those typical tours, this cycling tour will bring you different kind of experiences and point of views. Our guide is the staff of a guest house in the village, who has been welcoming many tourists. The tour party is limited to not more than six members. You can enjoy the tour in a relaxing mood. The bicycle is electrically assisted. No need to worry about your stamina. Whenever a spot catches your eyes, just stop, talk and admire the view. You will encounter with the life of the village people and the scenery dressed up always differently by the seasons and weather. Each encounter will surely be a once-in-a-lifetime moment. 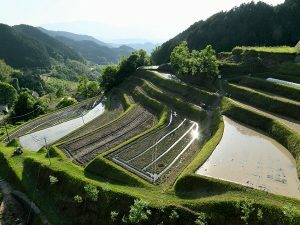 Beautiful Inabuchi terraced rice fields. This tour is not just a cycling tour. Get off the bicycle and hop on the stepping stones to cross the Asuka river. Climb up a small hill to watch the relics of Asuka-kyo old palace site and imagine how the palace looked like 1400 years ago. If you have a chance, you might come across a strange sight: the cut radishes on skewers hanging under the eaves. Or, you might learn from our guide that the irrigation channels in the village have been working since the Muromachi period (14-16th century). And probably, you will discover metal rings on a farmhouse, which were used to harness the cows for cultivating soils in old days. Thus, you can experience the life of the village, etc. through your eyes, ears, touches, thought, and imagination. Go cycling and dive into the unique and wonderful life of the village! Asuka village will surely make you happy and smiling. Nara prefecture is known for one of the Japan’s foremost cedar and cypress-producing center. 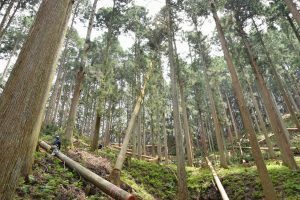 Forest accounts for about 70% of the total area of Nara, for that reason, forestry has been prospered since a long time ago using this rich environment. Even though those kinds of tree are produced in other prefectures in Japan, cedar is one of the representative tree of Nara. Among those areas, Yoshino (south area of Nara) is well known for tree producing in Japan. 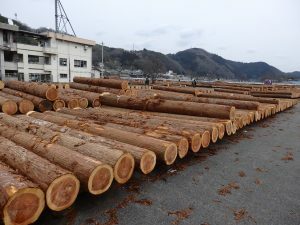 However some time the tree industry was fell into a decline, the history of tree industry in Yoshino counts about 500 years, it means continuing from Muromachi period (14th to 16th century). The afforestation method of Yoshino is called dense planting which is quite unique. 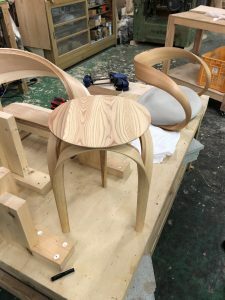 Because of this method, compare to other trees, the annual rings of tree are narrow and sturdy, so trees in Yoshino is adapted to a variety of uses like furniture, chop sticks, and so on. The lure of trees is not only its grain and strength, but also its beautiful color and mellow scent. The heartwood of Yoshino cedar has reddish and elegant color which is not seen for the other cedars. And Yoshino cypress basically has clean and luxury white color, and also has delicate and sophisticated pale pink color. It is interesting to enjoy these coloring of trees. In south area of Nara, some artists who uses trees are active. The artist who shaves tree with wheel and make dairy contraries. The artist who uses thin wood plate and make beautifully curved chairs. The artist who uses small plane to make beautiful grain patterns. Some of them are fascinated with Yoshino trees and came from other prefectures. We hope their products appeal Nara to all over the world. Have you ever eaten the rice cooked by “Kamado”? It is a most delicious way to taste Japnanese rice! “Kamado” is Japanese traditional oven with firewood. It is usually used for cooking rice. But nowadays you rarely see it in Japan. 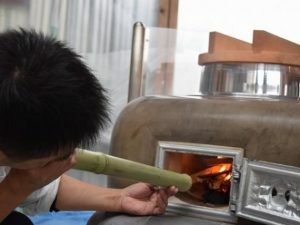 “Kamado” had been popular in our daily life until electronic rice-cooker and gas-range appeared.The heat can be controlled by adjusting the amount or positioning of firewood. The heating power is weak firstly , and then going on high. At the end of cooking, the power is going on low again. The series of the heating power brings out the flavor of rice. That’s why rice cooked by “Kamado” is more delicious and tasty. Recently, electronic rice-cooker companies develop their products to close Kamado taste, however it is a bit difficult to reproduce the taste perfectly in the household. 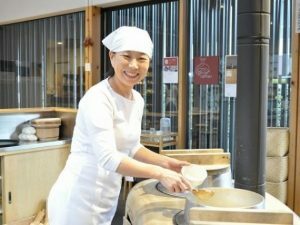 “Shika no fune Kamado” offers you the opportunity to eat Kamado rice and make Japanese rice ball. Please visit “Shika no fune kamado” and try tasty Japanese rice! Hiking Adventure in Mt. Kasuga Primeval Forest is our newly launched experience program. An expert of Mt. Kasuga will guide you to the historic and cultural world. Mt. Kasuga Primeval Forest has been preserved as a sanctuary of Kasuga Grand Shrine since Emperor Ninmyō (region: 833-850) prohibited tree felling and hunting during Heian period (from 8th to 12th century). It is unusual for the primeval forest like this to exist in the middle of the town, so Mt. 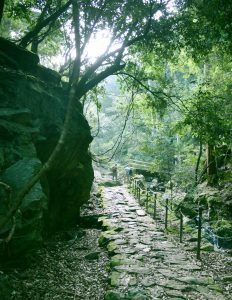 Kasuga Primeval Forest is designated Natural Monument in 1955. Also this combination of shrine and the forest was highly evaluated and designated as a world cultural heritage ‘Historic Monuments of Ancient Nara’. From a long time ago, Mt. Kasuga Primeval Forest has been composed in Man’yōshū including other anthologies. Mt. 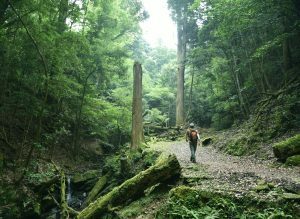 Kasuga Primeval Forest has not been preserved untouched but preserved touched by people since Heian period. A part of the forest, where the people of Todaiji Temple and Kofukuji Temple were picking Japanese star anise, was named ‘Kazan’ (Written 花山 in Japanese. Means flour mountain.). When trees were damaged by typhoons, people planted native trees to maintain its original condition. A lot of subordinate shrines are exists in Mt. 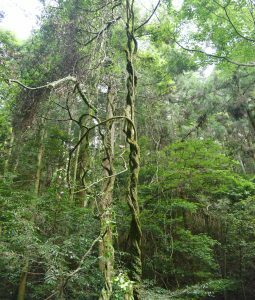 Kasuga Primeval Forest, and still widely practiced by people. Between Heian period and Kamakura period, many Buddhist priest trained in this huge forest, so some stone images of the Buddha are still remain. In addition to this, there are some places where we can feel this historic and cultural atmosphere. For example, the Japanese cedar which has been believed as a ceder planted by Toyotomi Hideyoshi and ‘Takisaka-no-Michi’ (old Yagyu highway). As written in the beginning, Mt. Kasuga Premival Forest is very rare forest. Coniferous trees like cedar named ‘Kasuga cedar’, maple and Japanese hemlock, broad leaved deciduous trees, ferns and mosses are distributed. Also this forest is a dwelling of birds, deer, flying squirrels and many kind of beetles. We are sure that this program will be your memorable time in Nara. Nara has a long history and is renowned for having three World Heritage sites; “Buddhist Monuments in the Horyu-ji Area,” “Historic Monuments of Ancient Nara,” and “Sacred Sites and Pilgrimage Routes in the Kii Mountain Range.” Because of its long history, various Japanese cultures originated in Nara, and here are some programs for you to experience them. It is believed that the first bout of Sumo took place in Nara between “Nomi no Sukune” and “Taima no Kehaya,” who was living in current Katsuragi-city, Nara. In 1990, Kehayaza Sumo Museum was built in Katsuragi-city. “Sumo Premium Tour” offers you various exciting experiences related to Sumo at “Kehayaza.” The highlight of the tour is a full-sized Sumo ring called “Dohyo,” where you can try Sumo wrestling. Also, enjoy a traditional song “Sumo Jinku,” which is unique to Sumo and usually performed at the Grand Sumo Tournament. 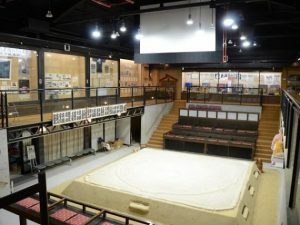 This museum houses more than 12,000 materials such as books related Sumo, “Banzuke” rankings, and “Hoshitori-hyo” matches and results. 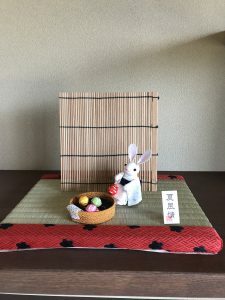 The tea ceremony, one of the exceptional Japanese culture, teaches the beauty of simplicity “Wabi and Sabi.” It was also born in Nara, so it is said. A custom of drinking tea has existed since ancient times, but the current style of the Japanese tea ceremony was established in the 15th century by “Murata Juko” of Nara. In the 16th century, many tea masters surged including renowned “Sen no Rikyu” while the tea ceremony blossomed, and various schools of the tea ceremony evolved. One of the schools was “Sekishu-ryu” based in Yamatokoriyama-city, Nara, which was started by “Katagiri Sadamasa”, a feudal lord of this area. In the Edo period (17th-19th century), this school became the official style of the Tokugawa shogunate, and thus favored by the feudal ruling class of Japan at the time. In this tour, you will attend an authentic tea ceremony at Jiko-in Zen Temple that was founded by Katagiri Sadamasa. 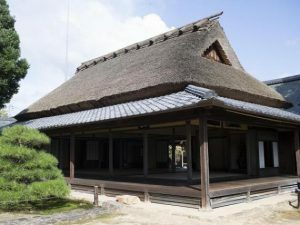 The whole grounds of Jiko-in Zen Temple was designed as one tea-ceremony house. Once you step into an approach to the temple grounds from the first gate, you are guided to a drawing room where you can see a pristine, manicured garden. There are also small tea rooms that make you feel like you’ve slipped back in time. All necessary settings for inviting people to the tea ceremony are here. It is a precious place, and rare even in Japan, where you can be in the scene staged by the great tea master from 300 years ago to find peace.